Pick your fancy dress and get the Carnival spirit, parading in a dream that's real! Backed by the Rio de Janeiro Mayor's Office which built Brazil's largest art and entertainment complex the Samba Schools are proud to present the making-of the greatest show on earth. Located in the Rio Docklands, "Cidade do Samba" clusters together the costumes workshops and float production centers of the largest Samba Schools in Brazil. 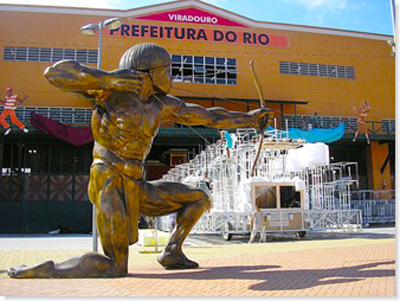 This entertainment complex is planned to offer visitors all the grassroots charm and excitement of Carnival throughout the year, enjoying the magic of the festivities that make Rio de Janeiro the world's party capital. Visitors watch real floats being built and see Carnival costumes being prepared, while learning about unique percussion instruments that hammer out that irresistible samba beat. "Cidade do Samba" is Located between the Morro do Pinto hill and Avenida Rodrigues Alves, close to the old warehouses (Armazéns 10 and 11), Following a metal walkway, visitors tour the fourteen Carnival factories and learn about every stage of building a float, among many other activities. Rio Samba City is open from Tuesday to Saturdays, between 10a.m and 5p.m.